It is a lot of fun shopping for your new puppy, but puppy gear can be expensive. Fortunately, some of the major purchases can often be borrowed from friends, or purchased second hand. 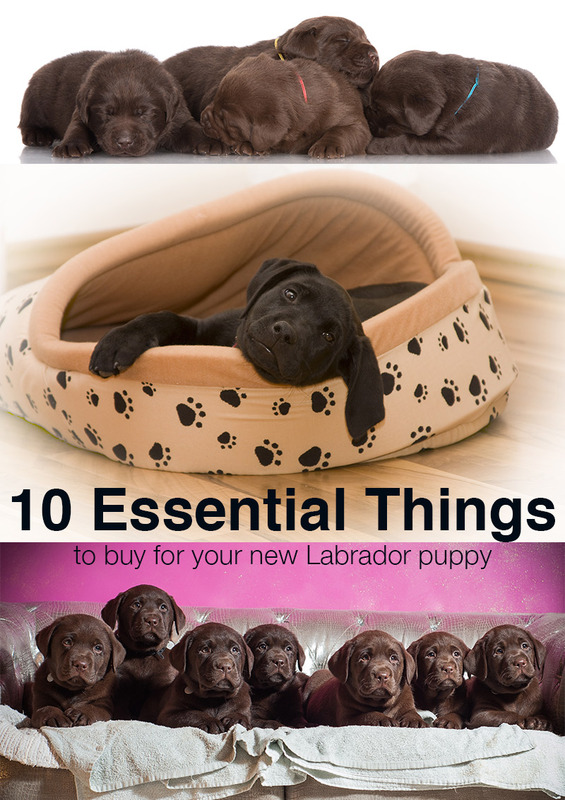 We’ve made a checklist of the most important things to buy for your new Labrador puppy. 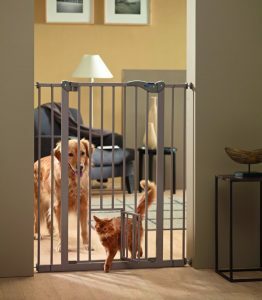 Baby gates are used to keep small puppies out of certain parts of your home. 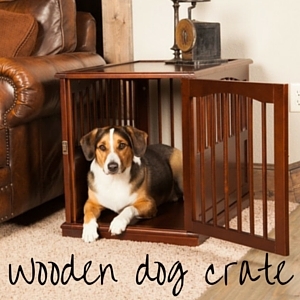 A baby gate that restricts your puppy to rooms with washable floors. It will also stop your puppy hurting himself on the stairs or playing unsupervised on your carpets. 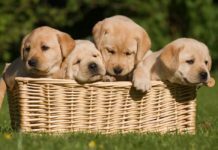 A puppy crate is used to create a safe den for your puppy. It prevents him hurting himself when you cannot watch him (whilst you are sleeping for example) and helps you to house train him. You need a small crate, or a big crate with a divider inside. It needs to be small, both to make the puppy feel safe, and to ensure he does not camp at one end, and use the other as a toilet. 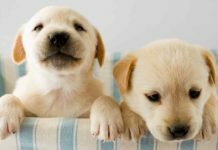 If you are not sure whether or not you actually need a crate, or how to use one, check out this article: The benefits of a dog crate. A plastic carry crate with handle will see your puppy through the first few weeks. 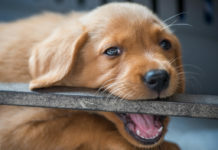 But once he gets heavy, and better at chewing, you’ll need a sturdy, well constructed car crate. These are available in a huge range of shapes and sizes to fit your vehicle. And some alternatives, such as a doggy seat belts and car dividers too. 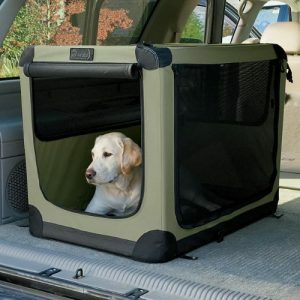 You can find a great range of travel crates for Labradors in this article. 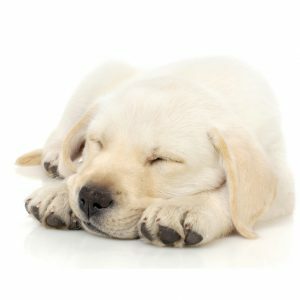 Vet bedding fleece on a roll is ideal puppy bedding. You can line both his bed and his car crate with this. Buy several pieces so that you can pop one in the washing machine when it gets dirty or if he has an accident. There are lots of lovely beds you can get to go around the house, but in those first days veterinary bedding is an essential alternative to keep his crate cosy and clean. 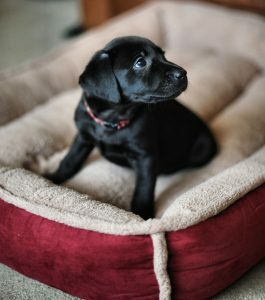 For your pup’s comfy bed in the living room, check out our Labrador Beds And Bedding Article here. Puppy toys need to be sturdy. Many puppies destroy soft toys quite quickly though they are so adorable, you may not be able to resist buying one or two. Kongs and rope toys are very tough and seem to survive the onslaught of puppy teeth. If you intend your puppy to sleep alone in the kitchen from the first night, you may find it helpful to leave a radio next to his crate. Just a simple, cheap Portable Radio with the volume turned down low can serve the same role as some human company. It just helps him feel less along during those first few nights when he may be feeling very homesick. 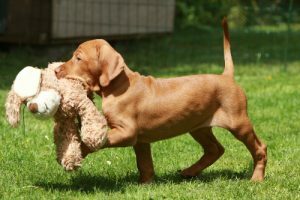 There is no rush for this, but once your puppy is too heavy to carry, and going out and about on the ground, he needs some kind of safety restraint. These days I usually recommend a harness as they avoid pulling on the puppies neck. 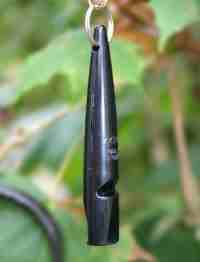 The kind where the lead attaches at the front and on the back are ideal. You can find an expert review of the big brands of harnesses, from a professional trainer here. When he is older and has learned to walk next to you, you can buy him a collar. 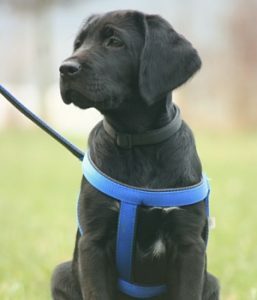 We also have some stylish ideas for you in our article on the Best Dog Collars and Leashes For Labradors. A clicker is used as an ‘event marker’. To let your puppy know when he has done something you like. 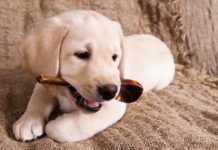 It is a really useful tool to help you teach your puppy to be quiet, and to learn simple skills. You can buy a very basic clicker very cheaply, you don’t need anything fancy. It will make training your puppy much quicker, easier and a lot more fun. 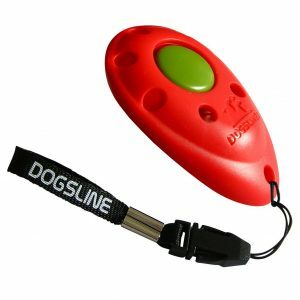 A whistle is used as a ‘cue’ to tell your puppy to do something. 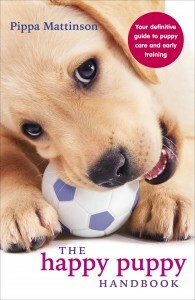 Getting a recall to whistle established at an early age gets your puppy training off to a great start. I recommend the Acme Dog Whistle. 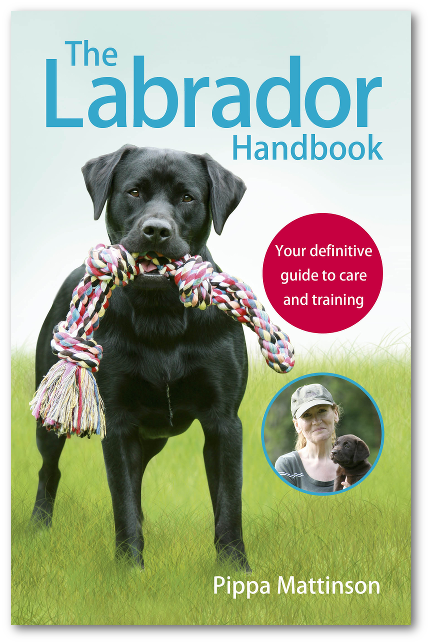 The Happy Puppy Handbook is packed with information on every aspect of raising and training your Labrador puppy. 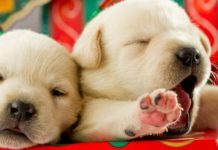 It will help to get you off to a great start with your new puppy. 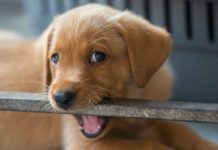 Have fun with your puppy! Don’t forget to join the forum for help and support, and to let us know how you get on.